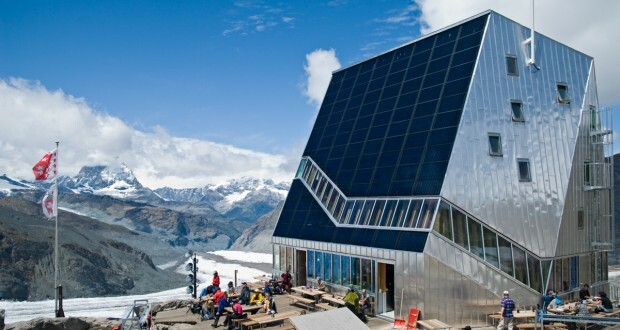 The Swiss Alpine Club’s Monte Rosa hut above Zermatt has failed to meet the energy targets set out during its construction, having to rely on diesel generators to supply enough power for the many climbers and walkers staying there. The much vaunted high-tech building was supposed to produce 90 percent of its energy from solar panels, with a generator fuelled with a few hundred liters of rapeseed oil used as backup during bad weather. Instead, the generator has been running fulltime, using around 7,000 liters of diesel during the climbing season. Since the hut opened to the public in 2010, it has become a major attraction, with climbers using it as a base for summit attempts and hikers now considering it as a destination on its own. During the first two seasos, they had nearly 11,000 overnight stays, far more than they had expected. The building can house 120 guests in its 19 bedrooms. The hut’s green credentials have taken a further beating. Wastewater treatment is supposed to be carried out in a special onsite facility, but because of a clogged filter, water used in the kitchens and the toilets has been released into the snow behind the building since last winter. The Swiss Alpine Club says that collecting the wastewater and transporting it by helicopter to the valley below would be nonsense ecologically since the dirty water itself is non toxic. Authorities in canton Valais disagree however and have asked the SAC to repair the facility, the first of its kind at an altitude of 2,883 meters, or face a fine. But the task at hand is not easy. According to the specialists who designed it says that space is restricted up there and that they cannot use more powers to run pumps. But with the difficulty, the compnay that built the wastewater treatment system has announced that they will try to fix the problem as soon as possible. Zurich’s Federal Institute of Technology, which developed the hut concept in collaboration with the SAC, has acknowledged that there have been problems but says that the situation is not as bad as it seems. Heat production has reached its target according to the university. The thermal solar collectors cover nearly 100 percent of the hut’s heating requirements. Power production has been more problematci, mainly because wastewater treatment required more electricity than they expected. The Federal Institute is looking to imporve the energy management at the hut in collaboration with the SAC and other partners.